Another October, another post-season, another rush by teams to win the World Series. So many have October baseball memories. LENNY MEGLIOLA: For Tom Yawkey, Yastrzemski was almost like an adopted son. And Yaz took advantage of that. He was, after all, the best player on the team. He had a director’s chair in the Red Sox clubhouse with a glass holder on one side and ashtray on the other side and cigarettes. He sipped wine after the game and smoked. He was king of the hill and he exercised that status. But I always felt bad for him because he was uncomfortable with the camera on him. Basically all he ever wanted to do was play the game. He gave very few interviews and was extremely private even in the unprivacy of a baseball clubhouse. When he was in the mood, he could be expansive, charming — even self-effacing. But if he went 0-4: watch out. There were a lot of people who didn’t like Yastrzemski because of his personality and some begrudged him his body of work, his great accomplishments. ART DAVIDSON: When I was still very new on the beat in the final years of Yaz’s career, he would be one of the first out in the trainer’s room sitting in his long underwear with a cigarette in one hand and a beer in another. He didn’t enjoy interplay with the media, but if you wanted an answer he would certainly provide you with one although it may have been brief. By his last game at Fenway he at least knew my face if not my name. HOWIE SINGER: There was Yaz bread, Yaz sausages. There was a song about Yaz. I grew up as a Yaz guy. He started playing in 1961 when I was two. I had watched him from elementary school through my college years and then my first year in the workforce. I was at his last two games. The day before his last game was Yaz Day. They gave posters out and the Painter’s Yaz Day hats. DANIEL MCGINLEY-SMITH: I got a painter’s cap that day that had “Thanks Yaz” on it and a button with his picture and his signature. 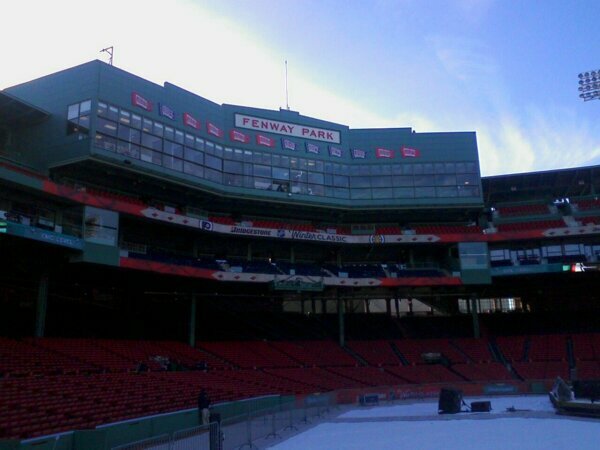 I still have the newspaper headline: “One Last Fenway Go-Around for Yaz” hanging on my office wall. There were two go-arounds for Carl Yastrzemski. On October 2, 1983, he took a pair of final laps around Fenway during pre-game ceremonies in his honor. The home team lost 3-1 to the Indians that day. TED SPENCER: October 2, 1983. I’m there for his 3,308th game. As an officer of the Hall of Fame, I had a season’s pass allowing me in the door with one guest. The pass just got you in the door. I had to stand up behind home plate, behind about 4,000 other people who were watching or trying to. That October 2nd Yaz played left field for the first time all season and went 1-for-3. His last hit was Number 3,419. In his last at he popped out against Dan Spillner and was replaced in left field by Chico Walker. The Red Sox icon took one more “final lap” at the end of the game. ART DAVIDSON: Yaz signed a few baseballs and gave them over to media members, sorta like a thank you. He also spent about an hour signing baseballs outside Fenway. BOB SANNICANDRO: During the game I had knocked on that clubhouse door. “You know I worked in ’72. Any chance I could talk to Yaz after the game?” I was told. Yaz came through the parking lot. He still had his uniform top was on, it was unbuttoned. I said, “Yaz, you probably don’t remember me but I was a batboy in 1972 and you used to call me Blondie.” I think he had a bottle of champagne in his hand. I got to talk to him a little bit. Then he said, “I gotta run. I gotta go upstairs.” We shook hands and off he went.